Full days driving - a challenging yet exhilarating experience! Now you have the chance to find out first hand with this driving experience which driving experience is the best, test the Porsche Cayman CTS agains the amazing Ferrari. You will drive each of these cars for 6 laps around the track. You then decide which is best! Then challenge your rally driving skills and take the wheel of either the Subaru WRX STI or Ford Focus RS. 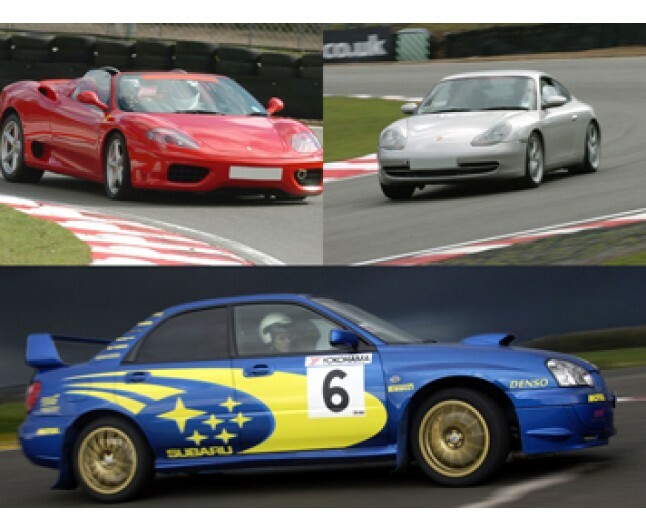 Your experience starts with a briefing from an experience race driving instructor who will explain the racing lines and how to get the most out of these two incredible cars. You will then head to the track. Duration : Please allow approximately 2.5 hours at the venue for the Porsche, Ferrari & Rally Experience. Location: Stafford Driving Centre, 3 miles from Junction 14 on the M6 (6 laps per car). Anglesey Race Circuit, Ty Croes, Anglesey, North Wales (3 laps per car). Three Sisters Circuit, Three Sisters Road, Ashton-in-Makerfield, Wigan (5 laps per car). Photo Package: We have a professional photographer on site and offer various photo packages, a choice of a single 9x6 framed photo, a CD of all the images or the full photo package. VIP Package: This includes a VIP lanyard, a complimentary tea or coffee on arrival, full photo package and a choice of one optional extra drive* (options vary depending on location). You will also receive a 50% off gift voucher to be redeemed against your next purchase at Driveme. Optional Extras: With all of our driving days, you can tailor make your experience with our optional extras. 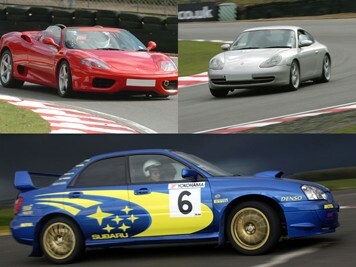 Depending on location these include demonstration laps, extra drives, extra laps, 4x4 drive, handbrake turns and a high speed hot ride with an instructor*. (Hot ride not available for VIP) Optional Insurances: Cancellation insurance. To cover you in case your event needs to be rescheduled. Damage waiver policy. To cover the driver in the event of an accident. All of the above extras and insurance details can be found and purchased at checkout. Restrictions: You must hold a full manual driving licence, be less than 6’6” and weigh less than 18 ½ stone. Availability: Events run at Stafford on selected weekdays and selected Saturdays and some Sundays from January to December. Events run at Anglesey on selected dates from March to October. Events run at Three Sisters on selected Mondays from March to September. Spectators: All spectators are encouraged to attend and will receive a free 4x4 off-road passenger ride (At Stafford Only). Extra drives and high speed rides are available on the day subject to availability. There is no limit on spectators at the venue and no age restrictions (under 16’s must be supervised by an adult) No animals are allowed onsite. Vouchers: Gift vouchers are valid for 10 months unless otherwise stated. We endeavour to dispatch vouchers by second class post on the day of purchase when ordered before 3pm. E-Vouchers are also available. Facilities (Stafford): Onsite parking, onsite catering facilities, children’s play area and picnic area are amongst some of the many facilities available at Stafford Driving Centre. Facilities (Anglesey): Onsite parking, Pit Stop cafe, spectators viewing areas and toilets. Facilities (Three Sisters): Onsite parking, on site cafe, toilets alongside the track and briefing room. Track Details (Stafford): The track is 1.1 mile long and consists of 2 main hairpins and chicanes. There is a track for handbrake turns and an off road 4x4 course which consists of obstacles. Track Details (Anglesey): The Track is 1.5 miles long and is an international racing circuit used for motor racing, the course consists of 2 hairpin bends and 4 long straights. Track Details (Three Sisters): The track boasts a length of 1,600 meters (1 mile). The twisting part of the track allows you to test the handling of your car and on the straighter circuit, you will be able to test the speed and acceleration of your chosen experience car.